This topic was suggested by listener Rose in a lovely letter she sent us. She may regret that now as we don’t really know all that much about cosplay, its origins or the culture surrounding it. At least we don’t try to talk about it that much directly and instead focus on issues of personal identity, sexuality, dress codes and cultural appropriation. If your wish is to lead a happy, fulfilled existence, then a Taoist master might instruct you to live without expectation. It’s certainly an endeavor worth attempting so long as you don’t expect to feel happy or fulfilled. But at the very least you won’t be quite so baffled by how a great percentage of the population seems to believe The Godfather is the best movie ever made. Perhaps it’s not truly the worst film ever made, but by the time Mandi and I got around to watching Coppola‘s gangland classic, there wasn’t even the glimmer of a chance it could live up to the hype. Our preconceptions indelibly coloured our viewing experience. 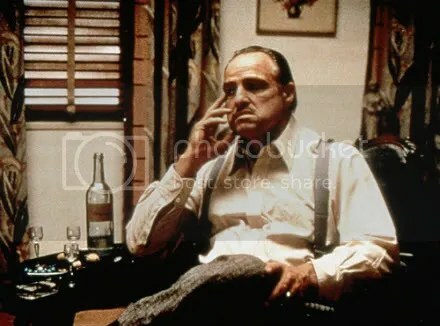 The Godfather didn’t just have to live up to the hyperbolic praise of its fans, it had to live up to our own deeply personal and unique judgements of what an “unsurpassed masterpiece” is (or just what a good mobster movie might be). Inevitably, it didn’t score well on either of our subconscious checklists. Because of the hype, it’s a film I find I’m personally incapable of judging on its own merits. I can’t be objective. The hype, in this case, is insurmountable. I don’t think it’s hyperbole to say we’ve all had a viewing or reading experience ruined by hype a few times in our lives. Plenty of terrific (or at least perfectly decent) films, books and television shows just don’t have a chance living up to our expectations—including, not un-ironically, Great Expectations. Luckily, no one over-hypes Nerd Hurdles. THE NERDS KNOW: For those of you hoping we’d talk about Star Trek more, we spend most of the episode responding to Chris Lockhart‘s email regarding our Voyager episode. Send in your feedback and questions to nerds@nerdhurdles.com. Tattoos have always been the ultimate in badass body decoration. Whenever filmmakers want you to instantly know a character is on the cutting edge, they give them some piercings and some tattoos. Ironically, both are things that have been around for thousands of years and are about as cutting edge as eating and breathing. But does that, and peoples’ obsessions with them, make body modifications generally nerdy? Maybe, maybe not. 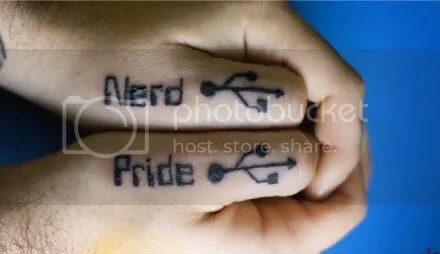 There certainly are a lot of nerdy tattoos out there and the Interwebs are absolutely rife with nerd tattoo blog posts. In fact, the examples below (except for #5) were all stolen third or forth hand from other blogs. Where most blogs give you between ten and twenty-five hot girls with Boba Fett sleeves and a million different Nintendo characters, we’ve tried to distill it down to five truly nerdy tats. Tattoos which aren’t merely a full-back Next Generation cast collage or the numbers from Lost or the Triforce symbol, but something especially nerderific. 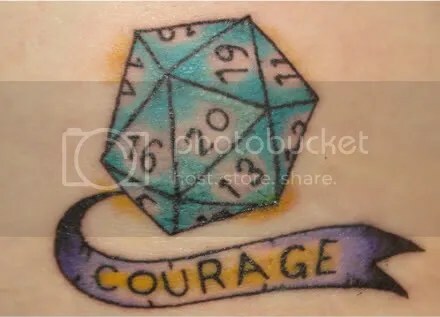 Of course, being purveyors of “Nerd Pride” ourselves, we’re partial to anyone who goes the distance and gets a tattoo of the phrase. And if they can make it USB compatible, all the better. Nerd on, brother, nerd on. 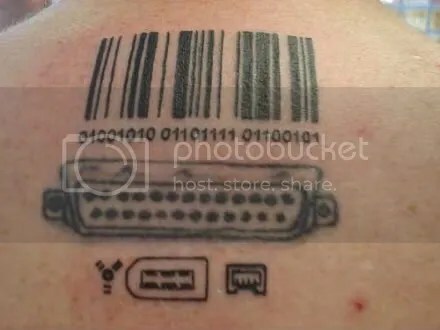 There’s probably more barcode tattoos out there than actual barcodes. Well, no, that’s clearly not the case. But they’re so common now they can hardly be considered nerdy. Douchey, perhaps, especially when they have words like “SLAVE” in the number field. But not really nerdy except in the sense people who get them probably think they’re über-cool when they’re totally über-not. There are also a lot of binary tattoos out there. Those are pretty nerdy. But this guy has taken things a step further and combined binary with an actual working barcode that produces his name when scanned. That’s actually pretty cool. In a totally über-geeky sort of way. (But, dude, the connector ports have got to go). You can read more about the tat here. 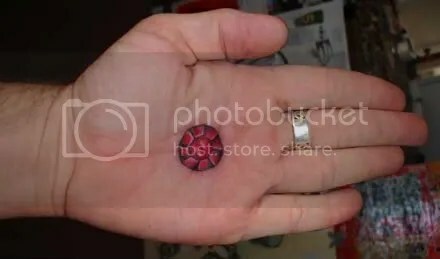 Sci-fi characters, props and logos tattoos are a dime a quintillion. You don’t know how many Darth Vaders, light sabers, Harry Potter lightning bolts and Enterprises I had to look at when researching this post. And yes, they’re all geeky, but pretty unimaginative. There’s something elegantly nerdy about getting a trompe l’oie costume piece tattooed right onto your body. And what better than the life clock from Logan’s Run? Though iconic to nerds who grew up in the ’70s and ’80s, not everyone is going to get it. This makes it the perfect nerd litmus test (especially when shaking hands!) at parties. There’s probably a whole generation of normies who’d have no idea what a red crystal in the palm of you hand means. On the other hand (pun intended), you’d probably get sick of explaining it after about two months. Plus that had to be excruciating to get done. I couldn’t have done it. The only way this could be more awesome is if they got it inked in white during their twenties and had the red filled in on their thirtieth birthday. Here’s hoping that was the case. 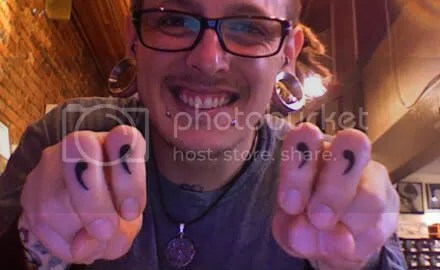 Anyone who does “air quotes” enough they can legitimize having them tattooed on their fingers is a nerd. Or a frakking douche. I have a feeling this guy has no idea how much of a huge nerd he really is. Say it loud, I am a nerd and I am quite proud, to be honest! Jakob and Mandi explore what it means to be a nerd in our society and why it should be a source of pride. Other topics include the Nerd of the Month and the ginger havens.